The Bible talks a lot about our words. 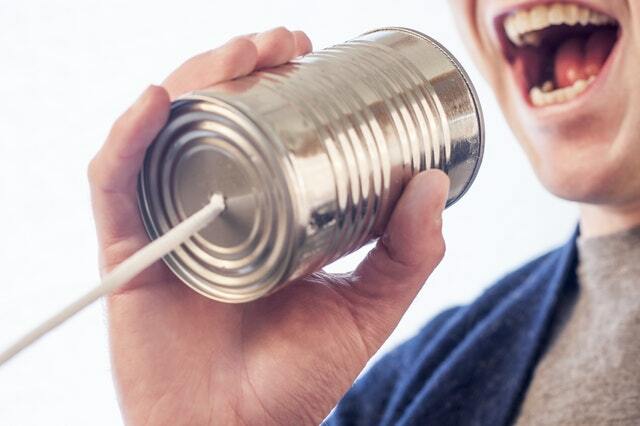 This simple object lesson will give kids a visual they will remember and help them think before speaking. Title: No Taking It Back! Key Takeaway: Our words can be stones that hurt or gifts that build up. Once they are out of our mouth though, they cannot be taken back. 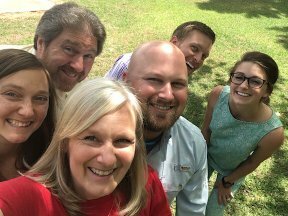 We probably have all heard or even chanted the jingle – “Sticks and stones may break my bones, but words can never harm me.” We would also probably all agree…that just isn’t so! Words can hurt. Words can damage. Words can scar! This Bible object lesson of being cautious and mindful of our words is an important one and one that the Bible speaks of often. •	Why do we brush our teeth? •	How often do you brush your teeth? •	Do you have to be reminded to brush your teeth? Hold up the tube of toothpaste. Ask for a volunteer to squeeze all the toothpaste out onto a plate. Encourage them to use all their strength and get it all out. Next ask for another volunteer to come and put all the toothpaste back into the tube. Offer them a spoon to help, maybe a toothpick, even a small funnel. Allow others to try if they think they can do better. We know the saying – “What goes up, must come down,” but in this case what came out does not just go back in! Our words are very much like this toothpaste. Have everyone say the word “anger” together. Now tell them all to take the word back. 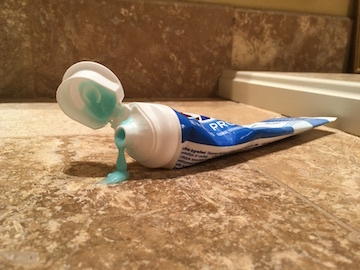 Trying to put the toothpaste back into the tube was difficult, but taking our words back that we say is impossible! Read the object lesson Bible verse - Ephesians 4:29 together. Then he talks about words that are good for edification and give grace. Words good for edification are words that build up & encourage. Words that give grace to the hearer are words that may not be deserved, but are said in kindness in spite of not being deserved. Let’s change some “unwholesome” words to words that build up or give grace. Words can hurt or words can heal. Words can leave scars or they can be soothing medicine. Pass out either strips of paper with this verse or attach it to a small tube of toothpaste for kids to take with them. Tell them to remember this simple object lesson each time they brush their teeth and ask God to help them use words that build others up. Take time to pray this verse together as a group. You have probably seen this on posters or here on the Internet. 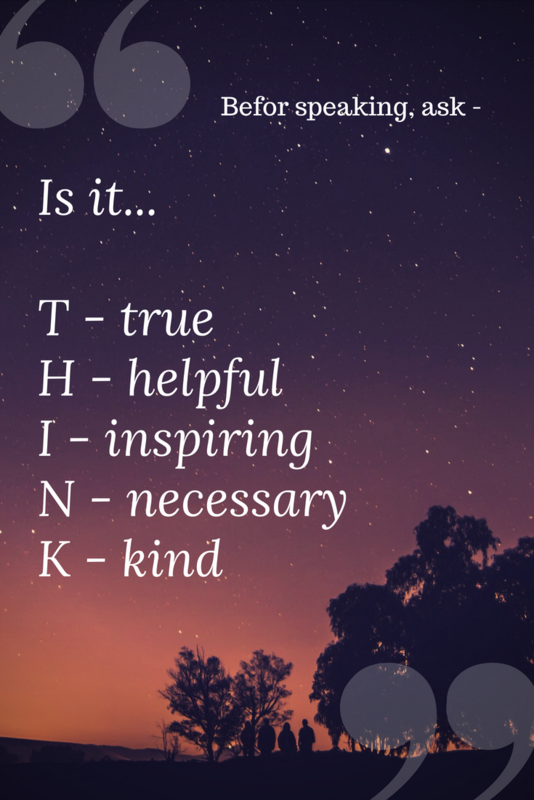 This THINK acronym is a great way for any of us to think before we speak. Before speaking, ask yourself - "Is it..."
Kindness rocks are another fun way for kids to remember this important Bible object lesson! Provide various size rocks for students to choose one and then either use paint or permanent markers to write a kind word on it and decorate it. 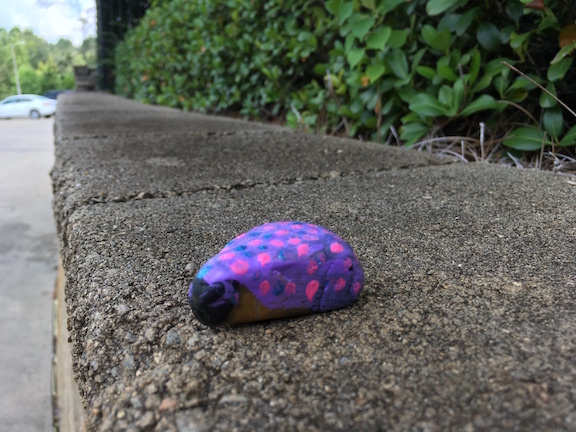 Encourage them to either give their rock to someone who needs encouragement or to leave it in a spot around church or town where someone can find it and be encouraged. Remind them that our words can be stones we throw and hurt others or they can be kindness rocks gently passed to another to encourage them and build them up – even if they don’t deserve it. May our words be gifts of grace!